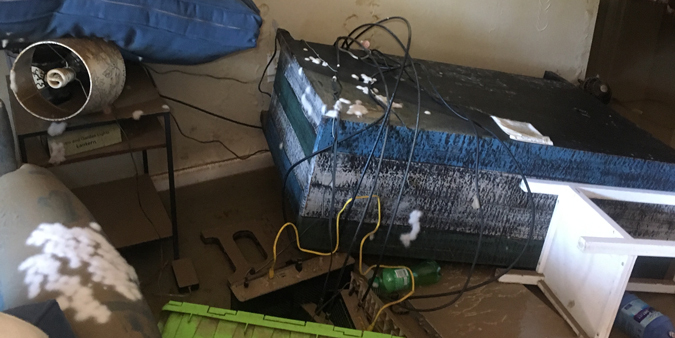 Flooding from Hurricane Harvey destroyed Dupaco Community Credit Union member Samantha Hermsen’s first-floor Houston apartment, leaving her with next to nothing. That’s when Hermsen called on her hometown credit union, which turned sympathy into action and helped her get back on her feet again. Over phone and email, Dupaco’s Tammy Wood helped Hermsen get an auto loan so she could trade in her car for a larger one as she prepared for the next chapter. Did you know floods are the nation’s most common—and costly—natural disaster? Many areas in the Midwest have already experienced significant flooding this year. “Until somebody sees this can actually happen, they don’t always realize it can,” said Mark Kremer, an agent with Dupaco Insurance Services. Floods are the nation’s most common and costly natural disaster, causing millions of dollars in damage each year. Homeowners and renters insurance don’t typically cover flood damage. Just 1 inch of water can cause $25,000 of damage to your home. Take photos before you start removing water and during the cleanup process to document the damage for your insurance provider. Kill power to the basement before entering the water, and be careful with exposure to the water, which could contain any number of unknown substances. Find out whether your insurance company will cover any of the damage. “Worst case scenario is they’re going to tell you that you don’t have any kind of coverage, but let them be the ones to tell you that,” Kremer said. Hold onto any receipts related to the damage: fan purchases or rentals, a new sump pump, you name it. Your insurance provider might reimburse you for some of those items. If you have a sump pump or floor drains in your basement, consider adding water-sewer backup coverage to your policy. It will help cover those times when your sump pump fails to do its job, when a power outage prevents your sump pump from running or when water or sewage enters your home through your floor drains. But remember: No homeowner’s policy covers floods or ground water seepage that enters through cracks in foundation walls and floors. Ask your agent whether you qualify for flood insurance through the National Flood Insurance Program. “Many people don’t believe they can get flood insurance unless they are in a flood zone,” said Tim Bemis, insurance services manager at Dupaco Insurance Services. “The truth is, everyone is in a flood zone. FEMA flood maps incorporate all areas and then assign a risk factor.” While high-risk areas tend to be what most consider “flood zones,” the less risky zones get preferential rates. MORE: Check out the flood history of your county with FEMA’s interactive data visualization tool. “People don’t believe they are at risk because they don’t live near water, but about one in five flood claims come from outside the high-risk zones and account for a third of all disaster assistance,” Bemis said. A couple of times each year—in the spring and fall—make sure your gutters and downspouts are free of debris and secured appropriately. Keep belongings in your basement elevated and away from areas known to take on moisture.